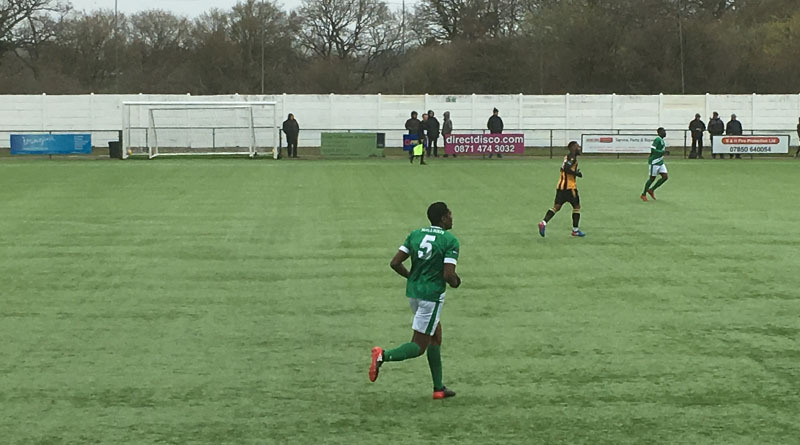 The striker’s 20th goal of the season four minutes from time was enough to see the Nuts & Bolts move closer to securing a vital play-off place as they look for promotion from the Bostik South East. Man-of-the-match Parish said: “I think it was probably not my best performance or the team’s either because it was a very hard game, but getting a last minute winner is always good. “Obviously at the moment we’re just playing each game as it comes, and trying to get three points each time. In difficult conditions, United struggled to breakthrough a resolute Grinstead defence and hardly mustered a shot on goal in the first-half. Although much-improved after the break, shots from Parish and Toby Ajala looked as if they were going to be the closest the team would come to finding the breakthrough. But with minutes remaining, the hosts worked the ball brilliantly down the right-hand side and a terrific cross from Mo Kamara allowed Parish to slide in and net the winner. Boss Tommy Warrilow said: “I thought we didn’t play that well today, especially in the first-half where we were only really knocking on the door. “It wasn’t poor, but I thought we could play a lot better than that and that’s what we’ll take into next week. “The conditions were horrendous out there but the most important thing at this time of year is to get the three points – that’s what we want the most. After giving debuts to new signings Jake McIntyre and Laurent Mendy, United will look to continue this momentum on and off the field as they travel to second-placed Horsham next week, knowing a win will take the team above their opponents into second in the table. Ashford United: Mott, Aboagye, McIntyre, Wisson (Mendy, 73mins), Coker, Kamara, Corne, Anidugbe, Parish, Williams, Ajala. Subs not used: Cox, Munyama, Woodcock. East Grinstead Town: Nakon, Bray, Wilson, Johnson, Emptage, Chapman, Mazzone (Boulding, 80mins), Prescott, Cundle, Dos Santos (Miller-Neave, 81mins), Smith (Day, 81mins). Subs not used: Cooney, Elliott.